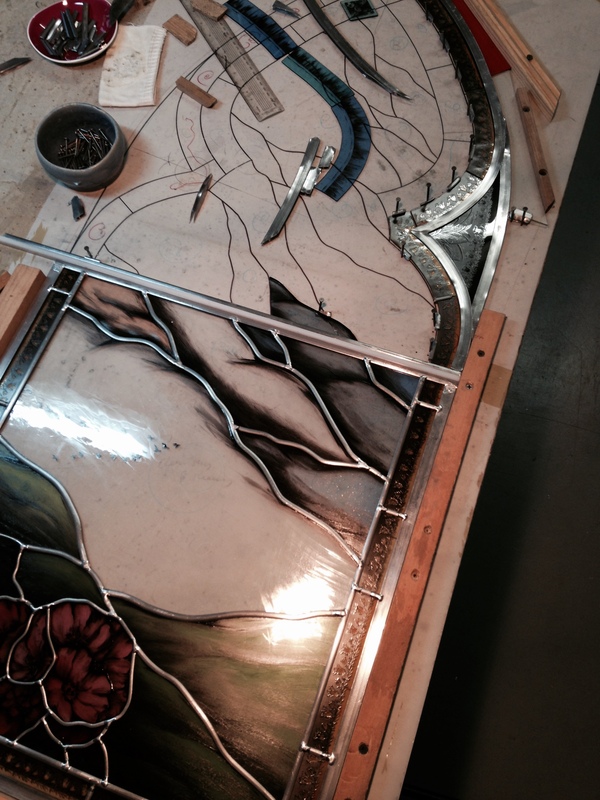 In the process of making stained glass there are two stages where the glass is easeled up against the daylight. First, when selecting glass, then later, when glasspainting. Easeling glass is time-consuming and thus expensive, so why do this? 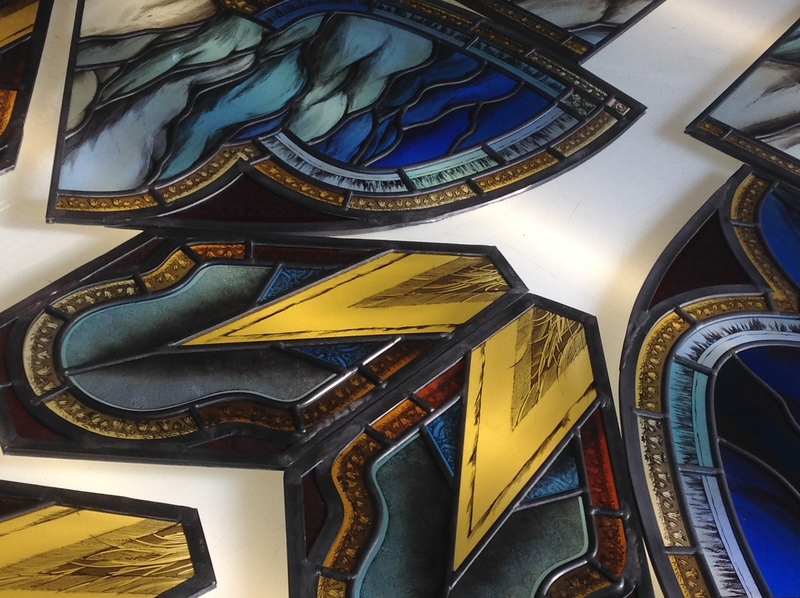 Here’s my current work for All Saints Chapel at Carroll College in Helena Montana. Note how the opalescent glasses change at night/dusk. This is an effect that can only be estimated, whether on light table or easel, because my north-facing easel does not precisely mimic the light in Montana. The easel does, however, take out a lot of the guesswork. Check a few older posts if you want to find out more about how and why glass is fixed to the easel, and watch the embedded video links. Stage one, selecting glass for colour, transparency/opacity and texture the English way, by fixing it to the clear glass easel plate with Plasticene; about choosing colour for a landscape window with figures; using beeswax and rosin (which fires off later in the kiln) in the process of waxing up (fixing painted, fired glass onto the easel for further layers of glasspaint); and details of a specific wet-matte technique that may be achieved with my https://coombscriddle.wordpress.com/2015/06/22/spreading-the-word-worldwide/proprietory propylene glycol mixture. Three days in the belfry..
Hurrah! 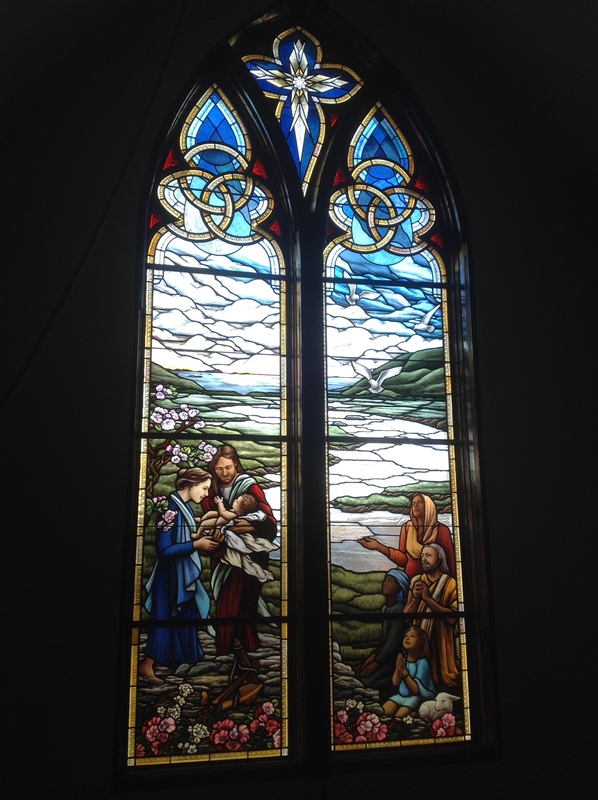 I just installed three more windows for Trinity Episcopal in Branford, Connnecticut, to accompany the Archie Hanna Memorial window (2013) and complete the facade that looks out onto the village green. 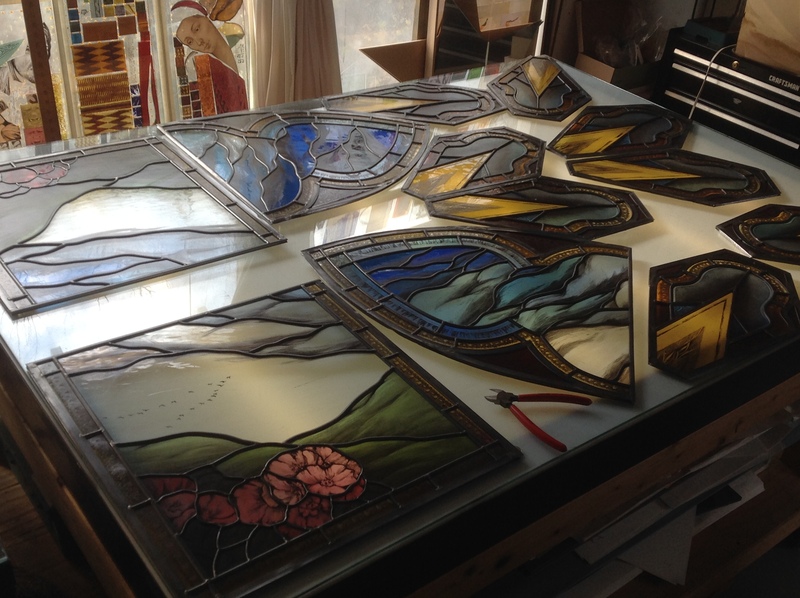 Above, the design; below, sections of the finished stained glass in the studio. 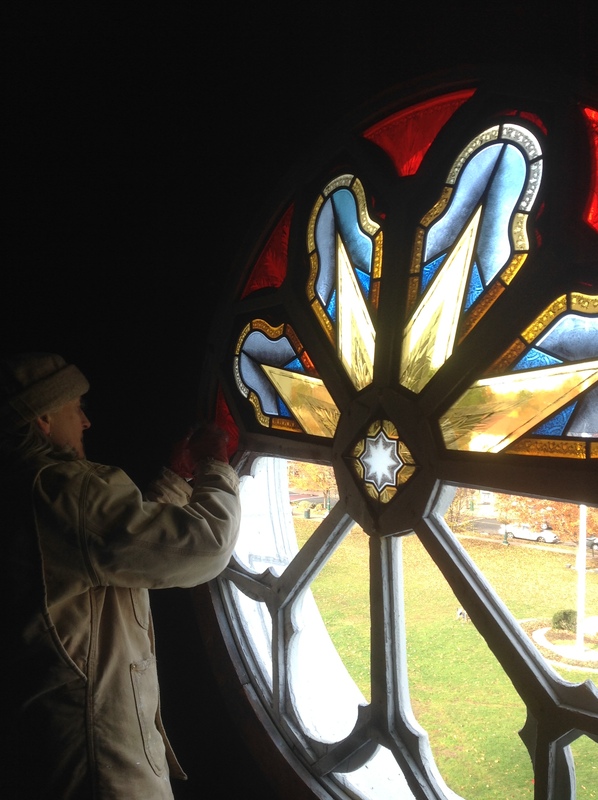 The rose window was made in pieces to fit into an original wooden window frame with curved tracery. The 162-year-old woodwork is sound and sturdy but the window frame had bowed and distorted somewhat over the years; the individual openings for the glass were far from symmetrical! Richard fabricated a carefully measured steel yoke to hold the old wooden frame securely in place for another few hundred years or so. I spent three days amongst the dust and pigeon poo in the belfry removing old glass; cleaning, restoring and painting the old wood frame; and installing my new window. Access to the bell tower was via a cupboard door on the choir loft. From there, all of our tools, materials and the new stained glass window had to be hauled up on a rope. We made the 35ft ascent dozens of times over the three day installation, climbing like monkeys up a succession of 1″ thick wooden battens that had been nailed to the beams of the church. The access shaft was barely 2ft wide (fine for me, but a bit of a squeeze for Richard!). I took the last photo with my iPhone, looking down over the toe of my shoe before descending through the darkness once again, groping to keep my footing. See our yellow rope fresh from hauling up a broom and some tubes of caulk, and the orange extension cord dangling into the abyss. The two little arched windows, each about 4ft tall, had their own special challenges to keep us on our toes. One was in a very small cupboard, the other perched over a stairwell, requiring an asymmetric ladder. Back in the summer we removed the old sashes and created new stops at the window sills. I made cardboard templates of the openings for building the two new windows. As with the rose, nothing was neat or symmetrical. 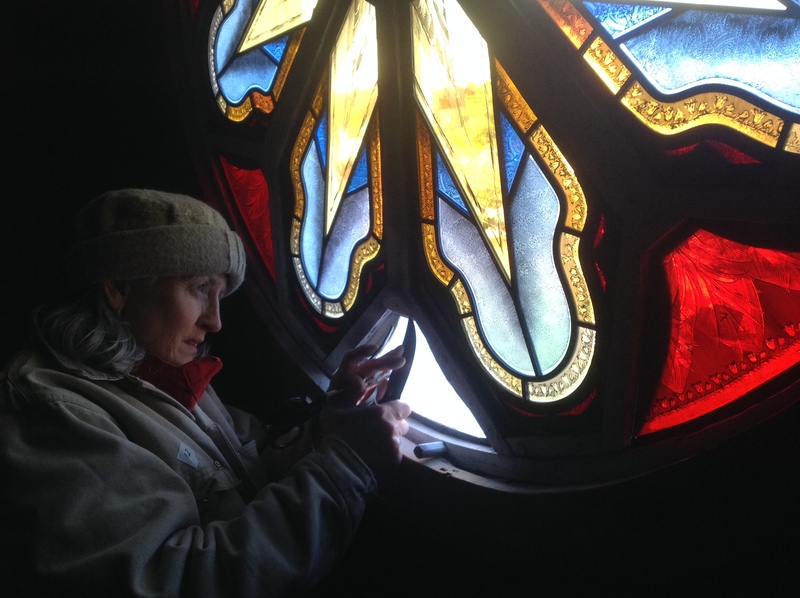 The new stained glass was held in place with pre-cut curved wood trim, sealed against the weather with compressible foam tape. Each has an aluminum H-bar for support that we’d prepped beforehand in the studio. 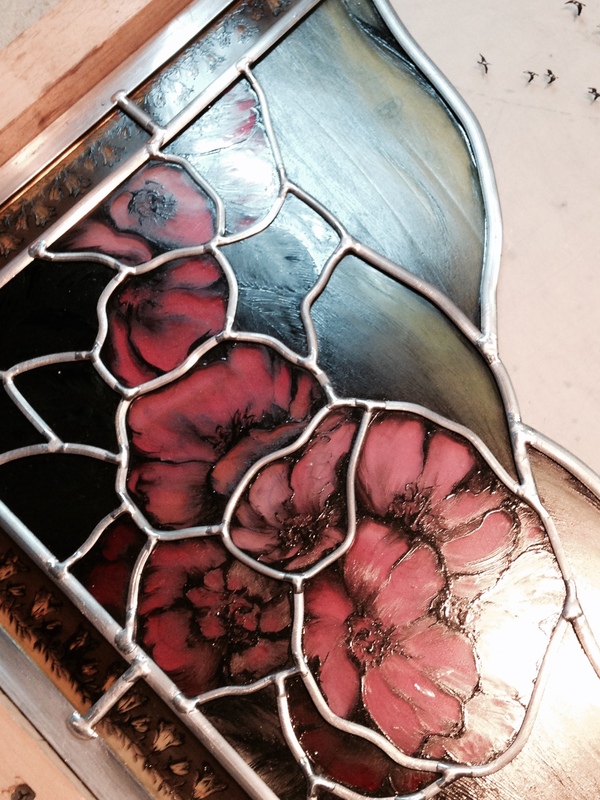 Why make stained glass for a cupboard? Or for the bell tower where no-one will see it? 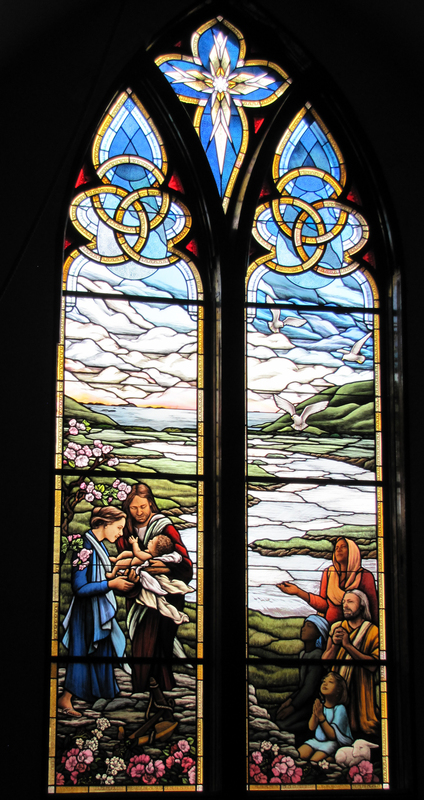 These last three windows are intended to be seen from outdoors, to complement and support the Hanna Memorial window. 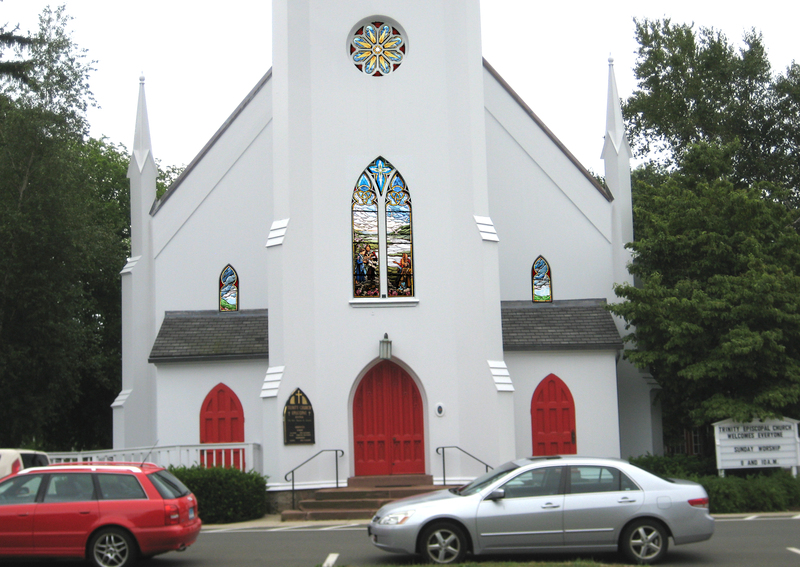 The stained glass will be illuminated from dusk ’til dawn, lighting up the facade of this lovely old New England church. Last year I posted lots technical information about the Archie Hanna memorial window (above) including cartooning, colour selection, glass cutting, sandblasting, painting and fabrication. There are some real-time videos of glasspainting too. The window shows the Holy Family by the Sea, with Joseph holding baby Jesus beside a salt marsh with, apple blossom, roses, wheeling seagulls and more. Browse through these by clicking ‘ Trinity Branford’ in the word cloud underneath the Search box to the right. 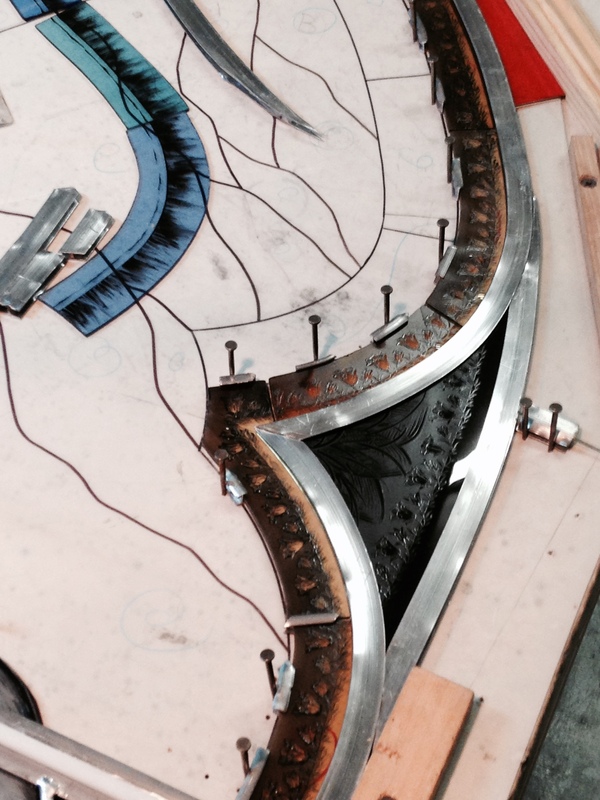 …and seeing the last few pieces of glass fit together on a project. The last of the roses for Trinity Episcopal in Branford Connecticut. It’s in at last! A stained glass memorial to much-loved Deacon Archie Hanna at Trinity Episcopal in Branford Connecticut. Everyone is welcome to visit the church on Saturday November 30th during Branford’s annual parade and tree-lighting ceremony. I’ll be at Trinity all afternoon and hope to meet some of the many parishioners who contributed to the stained glass. It will be a day of thanks and celebration! Many thanks to Matt and Dennis from Serpentino Stained Glass for doing such a great job on the installation. Thanks also to Carol Schaller and the Stained Glass Committee for great hospitality and wonderful home-made lunches during the time we were at Trinity. I’m looking forward to seeing you all again on Nov 30th. The window is at last finished. The final stage, cementing and waterproofing, was a joyfully messy process of covering the panels with a putty-based slurry and polishing everything to perfection. This is the center top panel, the Nativity star. 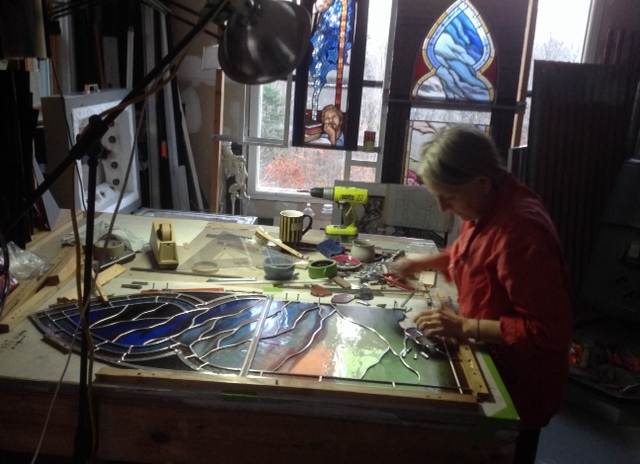 Stained glass tracery at the top of my window for Trinity Episcopal, Branford CT. 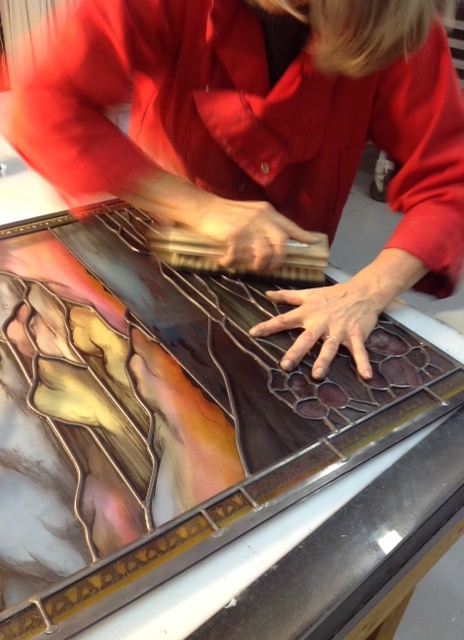 Assembling the painted glass into a matrix of lead channels. Soon to be installed, the window will be dedicated on November 30th.